Service: From 1946 to ? With regret I advise the death of Oscar Henry POMROY, 91 old, former Regd. No. 5751, a Veteran Member of the Coffs Harbour Branch of the RPA. 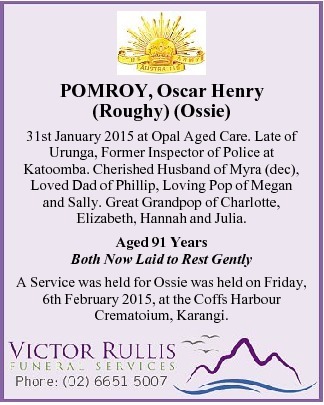 Oscar passed away on 31/01/2015 and his funeral is proposed to be held at 3pm on Friday 6th Instant at the Chapel, Coffs Harbour Crematorium, Coramba Road, KARANGI. 31st January 2015 at Opal Aged Care. Late of Urunga, Former Inspector of Police at Katoomba. Cherished Husband of Myra (dec), Loved Dad of Phillip, Loving Pop of Megan and Sally. Great Grandpop of Charlotte, Elizabeth, Hannah and Julia. Relatives and Friends are respectfully invited to attend Ossie’s Funeral Service appointed to commence Friday 6th February 2015 at 3pm in the Chapel of the Coffs Harbour Crematorium, Coramba Road Karangi. In lieu of Floral Tributes Donations to R.S.L. may be left at the Chapel. POMROY, Oscar Henry (Roughy) (Ossie) 31st January 2015 at Opal Aged Care. Late of Urunga, Former Inspector of Police at Katoomba. A Service was held for Ossie on Friday, 6th February 2015, at the Coffs Harbour Crematoium, Karangi. At Maurak, Milak, Aupik and Ami, the commandos frequently had been given reliable advance information by natives of enemy locations; and patrol casualties accordingly had been minimised. At Dove Bay the men prowled for an enemy who, wherever he was, was awaiting them. The first patrol clash of any consequence occurred on 27 May. Perkins took his entire troop, accompanied by an attached medical orderly and artillery and infantry signallers (the latter to communicate with mortarmen), and ferreted over the high areas to the south of the perimieter. The party made an early morning start and trekked along a ridge until it reached an east-west track which showed signs of recent heavy foot traffic. The troop turned west and followed the track down a slope to upper Mandi Creek which it crossed. When the field telephone was checked it failed to bring response. The trailing sig. wire had been cut. A sub-patrol returned and repaired the break and the troop continued its advance. Soon a clearing was reached in which holes recently had been dug. The soil was yet damp. The troop edged forward, each man a lubricated shadow. In the jungle no insect chirped and a Japanese who was shortly seen, seemed to slide sinuously into the undergrowth. Suddenly the jungle exploded with shattering fire. Rifles and machine guns laced the troop with lead and in the first moments Lietenant Land and Trooper NEM Mondon went down, both, fortunately, only wounded. Perkins drew his men back to the fringe of the jungle where fallen logs lay at the head of the track home. A call for artillery fire from the 25 pounders on Boram aerodrome failed because of communication inadequacy, but communication was established with supporting mortars and bombs began to fall among enemy pits. A strongly defended Japanese position having been found, and the reconnaisance object of his patrol thus achieved, Perkins decided to withdraw. It was beyond doubt that artillery and more than a troop of commandos would be needed to eradicate this target. The rear section filtered back along the track, not knowing that enemy had quickly moved behind the troop and were now astride the path with machine guns. As the point scout, Trooper AA Maurer, rounded the first bend he was killed with a burst of automatic fire. Corporal O.H. Pomroy and Trooper Worrad immediately went into action with blazing Brens. The attached medical orderly, Corporal CR Mahony, daringly dived under their fire to tend Maurer whose body he rolled to security over the creek bank for later burial. He braved the fire once again to return with Maurer’s weapon…….and so on. p320 and yet another incident “…….. The troop moved in again. Not yet had the enemy been destroyed, the barrage having been laid down slightly to the left of the position. Once more the troop drew fire from rifles and machine guns. Lieutenant Roper, Corporal HG Monk and Lance corporal CT Crawley, were wounded, Corporal Pomoroy with his Bren courageously covered the evacuation of the casualties. Two Japanese had been killed. p339……and yet another …..”On 23 July 2/10 Sqn, however, was to suffer battle casualties. This squadron had not been relieved by 2/7 Sqn to rest in dalliance at Karawop. It had received 39 reinforcements on 19 July, among whom were three officers, one of whom was allotted to each troop. A patrol led by one of these, Lieut. E.R. Lawler, made contact with the enemy near the village of Machouin, south-east of Suik, on 22 July. Next morning, Lawler led a patrol to the area again to check natives’ reports of Japanese casualties caused by them. The patrol comprised most of B Troop’s reinforcements with a leavening of seasoned soldiers in Lieut. Redmond , Lance-Sgt Simpson, Corporal Pomroy and Trooper Nichols. The reconnaissance was to be a routine one which would serve to temper reinforcements to active service conditions. Unfortunately, the Japanese had moved a force of about 40 men armed with rifles and a light machine-gun to defend a small spur leading to the village. The village itself was in an exposed area and the patrol correctly scouted to left and right instead of massing for attack. The enemy was concealed in pits on high ground at the rear of the village which covered the spur. Troopers LD Turner and IG Wharton , on the left, were killed in the first firing, collapsing one on the other. Sergeant Simpson, who had dived behind a mound, emerged to try to drag the bodies back, but was himself wounded by a burst of machine-gun fire across the right shoulder and neck. The situation was no happier to the right. Redmond and Tpr JN Jeffers had been killed and Cpl Mahoney the medical orderly who had so courageously tried to tend Maurer on 27 May, had been wounded. Mahoney’s wounds were serious ones. He had been shot through the arm and throat, yet still he tried to scrabble forward to minister to Jeffers. Jeffers, though, was beyond aid. Under cover from Cpl Pomroy‘s Bren, Tpr RG Denzel , a reinforcement medical orderly, extricated Mahony under fire. Denzel was awarded a Military Medal; Mahoney and Simpson were mentioned in dispatches. The citation for Denzel’s decoration laid particular emphasis on the fact that the deed was outstanding as the soldier had not been under fire before. When a later patrol came out to bury the Australian dead it was discovered that eight Japanese had been killed in the brief, but tragic, fight. It had been a day of tragedy for the regiment comparable with that of the ambush of the cavalry carriers at Derna in 1941.